The court, which puts drug-addicted criminal offenders through a yearlong march of treatment and intensive oversight in exchange for a dismissal of their charges, drives down the recidivism rate and saves money – and should be expanded, the Spokane Regional Criminal Justice Commission concluded. Jamie Hummell also has a high opinion of the court, but for more personal reasons. 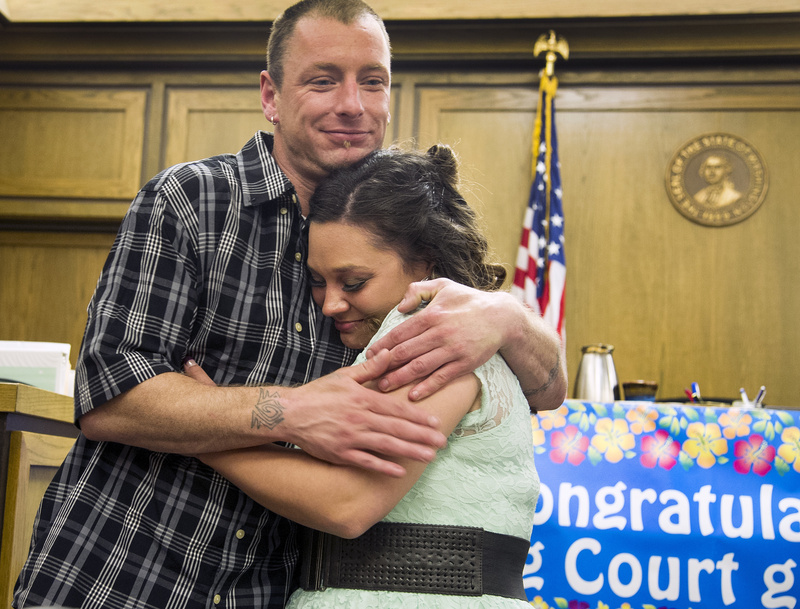 Hummel and five others graduated from Spokane County Behavioral Health Therapeutic Drug Court on Thursday. It was among the largest monthly graduation ceremonies for the court, which handles around 200 cases yearly. Established in 1996, it was the first local example of a “problem-solving court,” which attempts to combine intense oversight, treatment and services to help nonviolent offenders change their lives. The county’s mental health court and the city’s fledgling community court are other examples of the approach, which is aimed at stopping the costly and ineffective revolving door to the jail. “If you put an addict in jail, they come out of there an addict,” said Sandra Altshuler, the court’s coordinator. In Drug Court, felony offenders whose crimes are connected to their addictions can qualify if they agree to the terms. Participants are drug-tested regularly and must attend treatment and check in at court frequently. If they miss appointments, they are sanctioned with community service, and the court tailors their conditions – from sanctions to incentives to their treatment plan – based on their progress. Participants aren’t kicked out if they fall off the wagon, so long as they stick with the program and keep being tested. But before they graduate they must accumulate at least four months of clean tests. It is, for many of them, a difficult road full of setbacks. Still, there is a human ingredient in Drug Court that participants cite as a powerful force. From the judge to the attorneys to the therapists, there is a steady stream of support and encouragement. Spokane County’s Drug Court has tracked the recidivism rate among its population, and the results are dramatic, according to statistics compiled by the court. From 2007 to 2011, the recidivism rate among those who graduated was 11 percent in the two years after Drug Court, compared to 52 percent among those who qualified for the program but did not enter it. Graduates spent a total of 5,211 days in jail in the two years before entering the program, and that figure plummeted by 84 percent in the two years after. Even those who fail to complete the program showed improvement: The recidivism rate among those who quit the program was 36 percent, and the number of days spent in jail was much lower than those who qualified but didn’t enter. The Washington State Institute for Public Policy has calculated that every dollar spent in the types of treatment offered in drug court return more than $40 in savings, in everything from crime to education to social services. At Thursday’s graduation in the fourth-floor courtroom of Judge Ellen Kalama Clark, it was standing room only. Family, friends, fellow Drug Court members and court officials crowded into the room, which was decorated with banners of congratulations. Cubes of cake sat on little paper plates, and a row of gift bags and roses awaited the graduates. “It is, without a doubt, the best day we have in this courthouse,” said Kalama Clark, who took over the Drug Court a few months ago from Judge Harold Clarke. Sparber said he has struggled with addiction to heroin, methamphetamine and alcohol for years. He has sought treatment in various forms, including inpatient programs, but not until he landed in trouble with the law and entered Drug Court has he been able to quit, he said. “I was so messed up I can’t even tell you half the truth” about what happened, he said. Over the past year, though, he managed to get clean. He’s also gotten custody of his daughter and is moving toward adopting his stepdaughter, found a place to live, and has been working part time learning to fix cars. He’s also got a sense of optimism about his ability to stay clean. “It’s by far the best program I’ve ever been in in my life,” he said.